A Very Good Spring Day! Andrea Patterson	Spring Banding	Comments Off on A Very Good Spring Day! 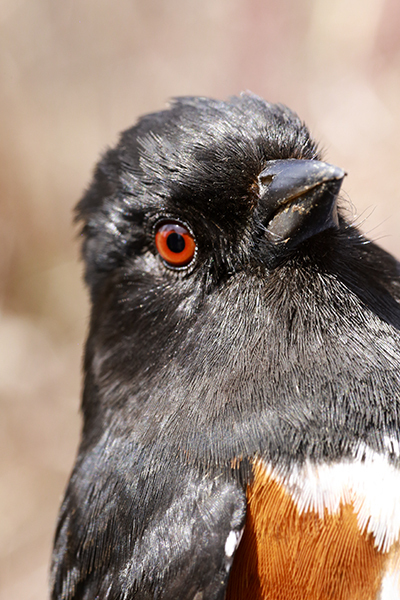 The first Eastern Towhee of the season. Photo by John Waud. Finally, a 36 Bird Day! brookser	Spring Banding	Comments Off on Finally, a 36 Bird Day! Wednesday April 29, 2015 36 new bands of 13 species; 3 retraps. New species Red-winged Blackbird. We had a milder day with a little more bird movement. Bird of the day was Ruby-crowned Kinglet with 18 banded. There were swarms of gnats again today as the air temperature warmed up, and we had three Blue-gray Gnatcatchers hanging around the station most of the morning. We had quite a few visitors who enjoyed the sunshine and seeing birds close up. Kyle was busy all morning sprucing up the net lanes in preparation for the many visitors from Cornell’s Spring Field Ornithology class scheduled for the weekend. Tuesday Low! Just Six Birds Banded! brookser	Spring Banding	Comments Off on Tuesday Low! Just Six Birds Banded! Tuesday April 28, 2015 Six new of six species; 8 retraps. It was a VERY slow day with only six new birds banded! It was a pleasant day but the winds were wrong. Dan Niven stopped by. Betsy mended a hole in one of the aerial nets while Nancy and Kyle observed. Kyle entered the first batch of spring 2015 banding data into our database. The MARS trailer arrived for the spring season so Katie and Stephanie can record the vocalizations of various warblers. Yesterday’s Yellow Palm Warbler Re-visits! 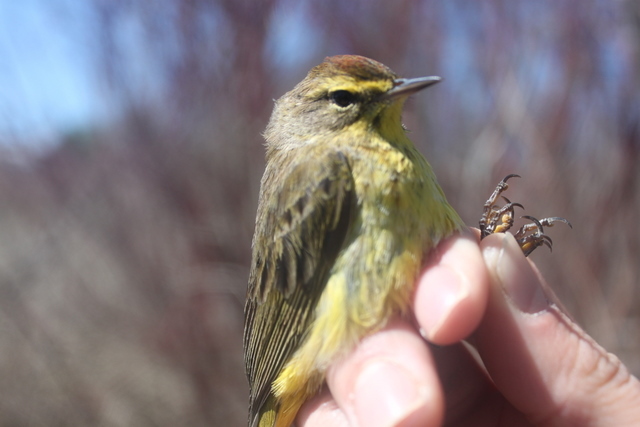 brookser	Spring Banding	Comments Off on Yesterday’s Yellow Palm Warbler Re-visits! Monday April 27, 2015. We had 27 new birds banded of 8 species. There are 14 recaps, one of them the gorgeous Yellow Palm Warbler banded yesterday (a treat for Betsy’s first day back!). Bird of the day was Black-capped Chickadee with 18 banded. We kept radar on all morning and dodged all the showers in the area. We welcomed our Spring 2015 Field Assistant, Kyle Kennedy, currently from South Dakota where he received his M.S. in Integrative Genomics in 2012. He was a Teaching Assistant at Drake University and also at the University of Minnesota Biological Research Station. It was good to have the Monday crew back together again! Sunday April 26, 2015: 9 birds of 5 species; 6 recaps. New species: Palm Warbler. Bird of the day was Black-capped Chickadee with 5 new bands. Ugh . . . another slow day! Will the winds never change? The morning started off cold and cloudy, but at least there was no wind. As morning wore on, the sun came out and blue sky appeared. The birds seemed to appreciate the warmth as much as we did, as most of our birds came near the end of our banding day. The only item of note today is the first Palm Warbler of the season. We decided it was of the “Yellow” subspecies, rather than the more common (for our area) “Western” subspecies. eBird has a really neat animated map showing the migration timing of these two subspecies. You can clearly see the Yellow Palms migrating first up the east coast, followed by a flush of Western birds through the midwest and Great Lakes region. Pretty cool! Yellow Palm Warbler. Notice the bright yellow supercillium and the near lack of white on the breast and belly. Photo by Ryan Kayhart. Today’s Bird of the Day was not at BBBO! Andrea Patterson	Spring Banding	Comments Off on Today’s Bird of the Day was not at BBBO! Saturday April 25, 2015: 17 new birds of 10 species, 20 recaps. Bird of the day was Black-capped Chickadee with six new bands. We banded the second Yellow-rumped (Myrtle) Warbler of the season, and managed to capture one of the Eastern Phoebes who have been singing incessantly about the station. The real story today, however, is the story of our guests. A group of students led by Dr. Sara Morris visited us from Canisius College. This group of ten (plus Sara) only got to see a handful of species, but as always they made the most of each bird they saw. Students got to see rectal bristles, filoplumes, a cloacal protuberance, fault bars, and leucistic feathers. Class outdoors is almost always better than class inside! It was also Bird of Prey Days over at the Braddock Bay Park, and the Raptor Research team had organized tours of our songbird banding station. Other folks filtered through as well, and we counted approximately 22 adults and 14 kids at the station today. Two guests came from London, and most of the rest were from New York. Two visitors from Virginia made a big impression – teenager Sage has an interest in birds, and had saved money for a couple of years to come and visit our area. He spent his on money on a scope, and has been working hard to educate himself on birds and birding careers. We hope we’ll see him again! Another youngster who impressed us all was Mason, a local boy who knows quite a lot about birds. In fact, several of the children who stopped by told us about their feederwatch projects, about the habits of woodpeckers, and about other birdy things. If today is any indication, the future of ornithology is in good hands. We still haven’t told you of the guest who caused the biggest splash. Adult visitor Candy was showing us pictures she had taken in her backyard, and among them was a Varied Thrush. Jenna asked her if she lived in California, and Candy said the pictures were taken this morning in her backyard in Irondequoit! This caused quite a stir at the station, and Candy was kind enough to allow us to post contact information to the local bird listserv so that others could observe and enjoy this rare visitor from the west. Last we heard, she’s had a string of visitors at her house and many have been treated to good views of this fantastic bird. 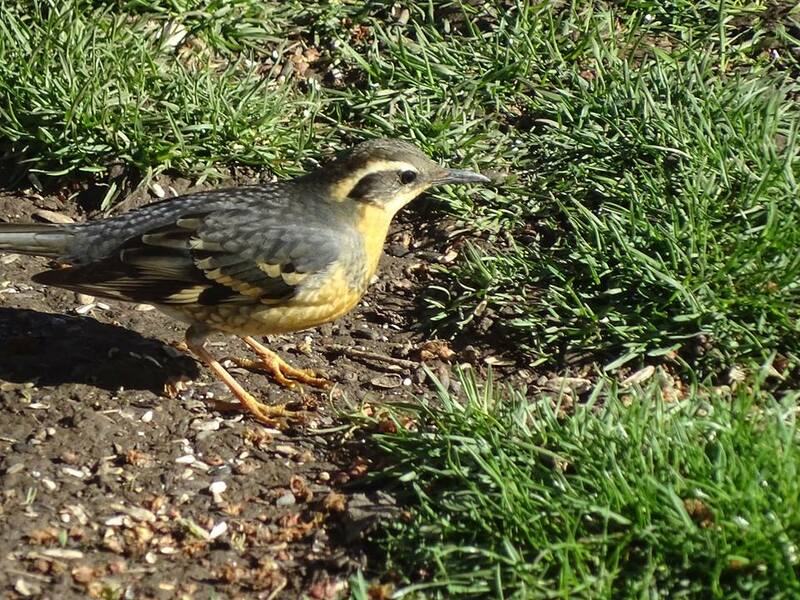 Varied Thrush, photographed on 4/25/15 in Irondequoit, by Candy Giles. We had a cold, slow day on Friday, April 24. There were 27 birds brought in from the nets, but 18 of those were recaps! 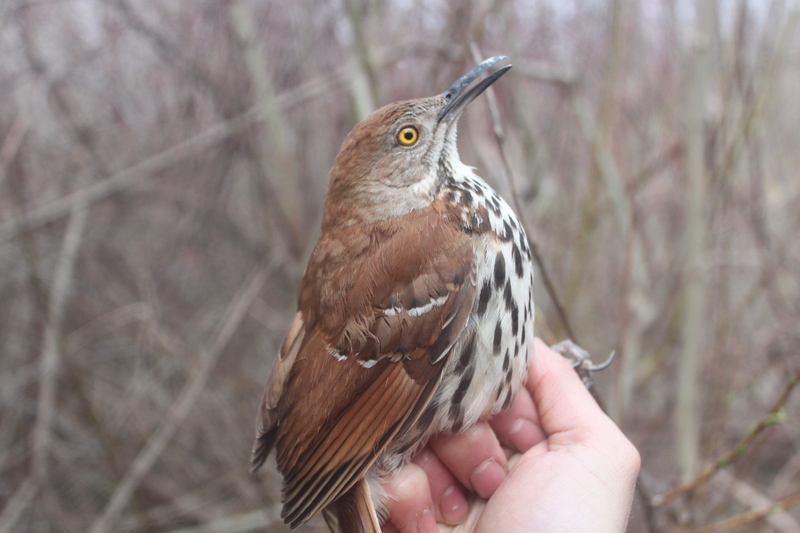 One new species was highlighted on the list – the first Brown Thrasher of the spring! If the 18 recaps, 15 were Black-capped Chickadees! At one point, the nets looked interesting – all studded with snowflakes! Yes, we had a brief snow shower at one point! It was a great surprise to see Ryan coming from Vermont early this spring. As always, he is a great help!